Finally a series victory that silences the ghosts of the horrendous world cup exit. Experts may argue if it was the best Indian performance in a series outside the subcontinent, but for me it ranks among the top three in the past twenty years. The near victory against Australia, beating the hell out of Pakistan, and teaching the Brits some swing, all have come as tourists. The victory in the Caribbean may seem a noticeable omission, but that was against a relatively weaker team. A victory away is always a plus, but still it doesn’t ring up on my top three. 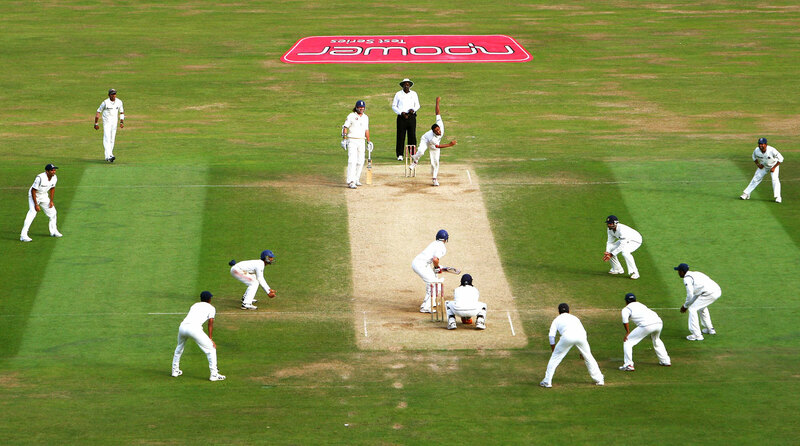 This image to the right reminds me of an incident my dad always told me about, when Dennis Lillee bowled with nine slip fielders. Lillee will always be remembered for his antics with the aluminium Bat, or his spats with Javed Miandad or Sunil Gavaskar. Famous cricketers have always been in the news more for the wrong reasons than for getting a century or a five wicket haul. I’ve been following a lot of blogs this past week with a strong ‘August 15th’ flavor. A lot of people have been writing about what really binds our country, for there is a lot of infighting between the states. Kashmir has it’s own set of troubles and is too busy to bother bout the rest, Rajasthan is slowly moving towards progress with reforms with little success in the villages. Gujarat has nothing other than ‘Modism‘ to speak about, MP and UP may well be the biggest states in terms of size and population but are torn by caste politics. Maharashtra has nothing to be proud of itself barring Mumbai and Pune and the plight of sugarcane farmers is suicidal. Karnataka and Tamil Nadu have an ever going water battle while Kerala and West Bengal are drowned in communism. Andhra Pradesh is on the verge of being split and losing Hyderabad to Telangana, while Orissa has either drought or floods to keep itself busy. Bihar might be the richest state in terms of resources but they have themselves to blame. The north eastern states are almost forgotten and are treated as mere electoral bastions with no voice. This leaves us with Himachal Pradesh, and Haryana which are just for mere numbers and too small to create any trouble. Now comes the host of new states that were just created to satisfy the pleasures of the political bigwigs behind them. We have union territories that were created owing to political pressure and ‘vote bank‘ politics and thus can again be ignored in this discussion. Punjab for me stands out amongst all the other states, in a time where people are shunning agriculture and moving to cities in search of a better life, Punjab has flourished! They are self sufficient as they mind their own business but are a force to reckon with. What binds these states with problems of their own is, ‘Cricket’! I’m aware that many will disagree with my statements and cite other unifiers such as ‘Cinema’, brotherhood etc. How can one talk of cinema when some states are banning movies by other industries in the bid to promote their own cinema? In a world when a film from a neighboring state is treated in the foreign language category section, you talk of cinema? Where does universal brotherhood go when factions of society go after each others jugulars on the pretext of caste and religion? For the past 60 years many factors have contributed towards holding our country together which always seems to be on the verge of breaking up. The one factor that evokes the same amount of response in people of all ages, regardless of caste and religion, is ‘Cricket’. This post was written almost a week ago but laziness crept in and it never saw the light of the day. With a disaster at Southampton on the cards, it all makes sense again!